We have advanced polishing technology and complete quality control system and focus on producing and exporting all kinds of stone, glass and other products. These products are widely used in construction, decoration, landscape gardening and aquarium layout design. Q4:Do you inspect all your goods before delivery9 A:Yes, we have complete quality control system and have 100% quality control before delivery. And strict persons to inspect quality before shipping . You can please send us your own design pictures ,sizes and other details ,we can produce for you . However ,we can also accept your small quantity order . Pls contact with us and make sure what sample do you need. Please contact with us to confirm detail before placing order. Pls contact us any time with any questions or inquiry. 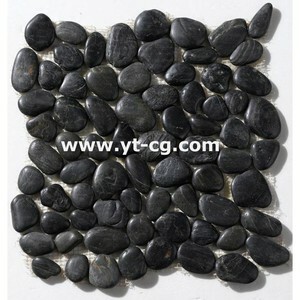 pebble mats are made of our local natural stone and used for garden decoration. They have many sizes available. And they are exported to many countries in Europe and Canada, Japan, Australia,etc. 9 Payment terms T/T (30% payments upfront, 70% payments against documents) or L/C at sight 10 Delivery Normally in 2 weeks or sooner if it is urgent 11 Shipping port Nanjing or Shanghai,China 12 MOQ 20T Welcome to contact with me at any time. Our Stock and Packing details: Different Color at different size for your choice: Polished Pebble Stone Tile 30x30cm: Polished Stone Pattern As per customized order: Polished Pebble Tile Border and Standing Border tile: (1)Advantages 1) Our Brand : SUN RISING is specializing in natural stone industry since 1995. 2) Design: According to customers drawing or photos or as usual or by our design and R&D department. 4,MOQ: 1x2ft with mixed style container,sample order is negotiable 5,Package: Fumigated seaworthy wooden crates with plastic and foam inside 6,Delivery : Within 15-20 days,depengs on customers' order quantity (5)Quality Assurance During the whole production process,from material choosing, fabrication to package,our quality auditors will strictly control each single and every process to ensure quality standards and punctual delivery. Nanjing Just Import & Export Co., Ltd. 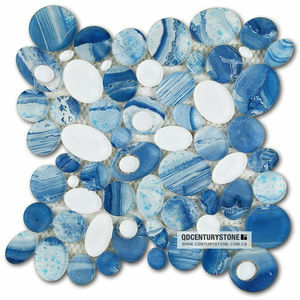 These types of pebble mosaic look beautiful and easy to install. Our company's pebbles and river stone products are more natural than ordinary ceramic tiles, with natural texture and color. More Pebble tile pictures and bulk production, work shops and quarry mine pictures e.
We have specalized inthe design, development, production and marketing of all kinds of stones for many years. Insurance Service Sometimes the stone products were damaged during transportation by sea. To decrease the loss of our client, we offer the service for insuring the goods for clients. Theres is a person specially assigned for conducting our goods . When the goods reach, this person will check the package again. Then load the goods to container taking the picture and recording the loading list . 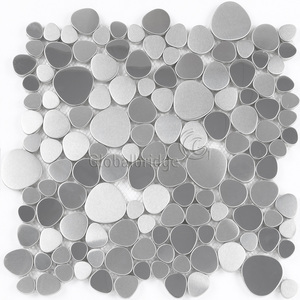 Alibaba.com offers 4,876 pebble tile products. About 38% of these are mosaics, 23% are cobbles & pebbles, and 5% are tiles. A wide variety of pebble tile options are available to you, such as free samples, paid samples. There are 4,590 pebble tile suppliers, mainly located in Asia. The top supplying countries are China (Mainland), India, and Nepal, which supply 92%, 3%, and 1% of pebble tile respectively. Pebble tile products are most popular in North America, Western Europe, and Mid East. You can ensure product safety by selecting from certified suppliers, including 612 with ISO9001, 579 with Other, and 258 with ISO14001 certification.